One of the things I love about the English language is its fluidity, its inventiveness, its hunger for the new. I feel that it is that language which organically moves, dances with the speaker and not in the moldy rooms of an academy. One that gives way to new words, phrases just as quick as your dough rises; and as you punch it down and let the air out, so will the language leave behind the stale and the old. Case in point the words recycle, upcyle, distressed. All of them refer to something used or made to look like it’s used. But instead of the flat original, with a shiny sparkly couture bow right on top! So when I broke my makeup mirror and all the pulverized fragments of glass lay strewn on the floor, the first thing I thought of was not to get the broom, but all the ways I could use (cough) upcycle its sad looking empty stand. One of the ideas I had was to turn it into a functional piece, a bracelet stand. It turned out the stand itself is sturdier than I thought. The stainless steel was really hard to get into a straight shape. I ended up laying it upside down on the concrete paving stone in our garden and hammering it for minutes it seemed. 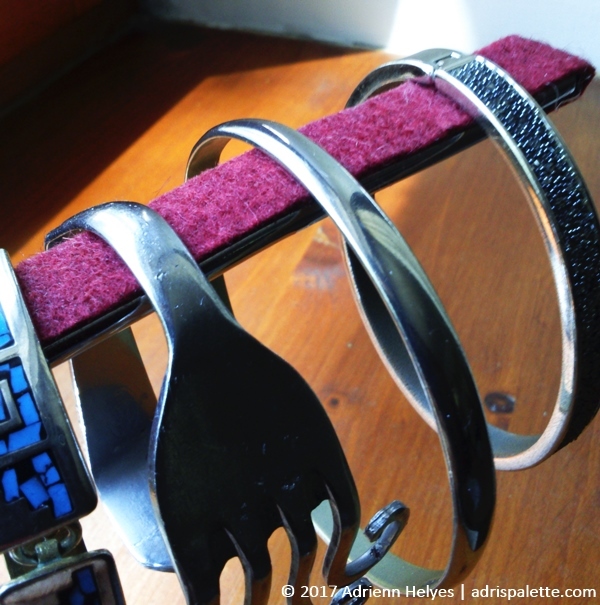 It is still not 100% straight, but with its slight upward curve it will keep my bracelets safely in place. To finish I glued a strip of felt onto the arms to prevent the bracelets from slipping and sliding and give them something to grip to. I wanted to choose a color that is rich and has lots of depth. I think this wine color complements the classical lines of the stand itself. 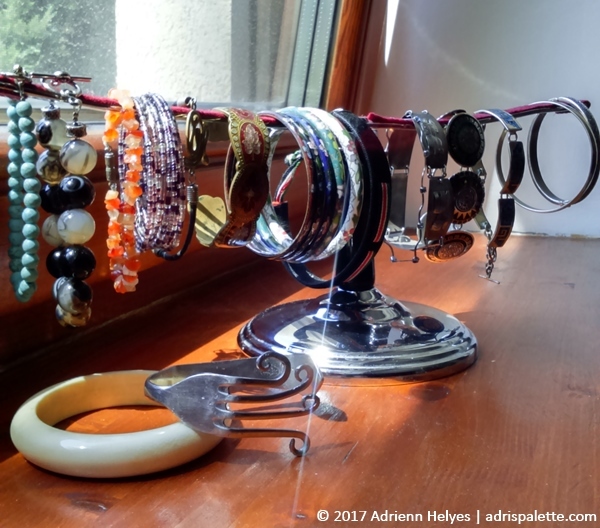 The length of the arms is just perfect: I can fit all my bracelets on it, and it gives me the chance to sort them any way I want. I am really glad I made this little stand. I used to keep most of my bracelets in a little overcrowded basket and half the time I forgot the beauties I had. Gifts and memories from far away travels, keepsakes from the loveliest colleagues, friends, and family or just little purchases I’ll never forget. I got so sentimental in fact, that I rummaged in old boxes and looked for ones I’ve long ago forgotten. It is nice to look at them, jingle them a bit and start thinking about an arm-party, a.k.a. overcrowding your wrist with bracelets.